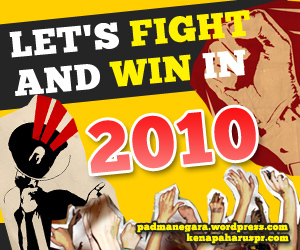 Are you ready to rumble in 2010? Yeah, this is my first post in 2010. I can say 2009 is my year in the “jungle”. The tough workforce, the new knowledge, new business established, and a lot of wonderful things happened. What about 2010, ok, perhaps i’ll share my resolution for 2010 to you later. No matter what will hamper me, 2010 should be my year. Cheerrioss 2009, Let’s Rock 2010!! so, what is your resolution ? ?